Depression is one of the most common mood disorders. Everyone experiences depressed moods from time to time. More commonly referred to as "having the blues" or "being down in the dumps," the sad or depressed mood usually lasts for only a short period. When the feeling persists for weeks without apparent reason, however, it may be a sign of major depression, a psychiatric disorder. The symptoms of major depression include a sad or depressed mood or a marked lack of interest and pleasure in almost all activities. This feeling persists for most of the day, nearly every day, for at least two weeks. In addition, many or all of the following symptoms occur: (1) loss of appetite; (2) fatigue (tiredness); (3) difficulty sleeping; (4) feelings of guilt or worthlessness; (5) lack of concentration; (6) thoughts of death, often including suicidal thoughts or plans, or even a suicide attempt. People with major depression are also very likely to experience headaches, stomachaches, or pains or aches almost anywhere in their bodies. Major depression affects twice as many women during their lifetimes as it does men. Bipolar disorder: Formerly manic-depressive illness, a condition in which a patient exhibits both an excited state called mania and a depressed state. Electroconvulsive therapy: A form of treatment for depression in which an electric current is passed through the brain to produce convulsions. Lithium: Natural mineral salt used as a medication to treat bipolar disorder. Mania: Condition in which a person experiences exaggerated levels of elation. Neurotransmitter: Chemical that transmits electrical impulses from one cell in the nervous system to another. No one knows the fundamental cause of major depression. Scientists believe this disorder might be caused by a low level of certain chemicals in the body known as neurotransmitters (pronounced nur-o-trans-MI-ter). These are chemicals that transmit information (electrical impulses) from one cell in the nervous system to another. Thus, depression may be more a biological than a psychological disorder. This conclusion is supported by the way depression often runs in families: up to 25 percent of those with depression have a relative with a mood disorder of some kind. Furthermore, if one member of a pair of identical twins has major depression, the odds are about two in five that the other one will, too. No one is quite sure why major depression affects more women than men. It could be that women, because of their monthly hormonal changes, are more biologically vulnerable. Another explanation might be that our society puts added pressures and limitations on women's lives, which could lead to feelings of helplessness and depression. One more explanation could be that women and men experience the same rate of depression, but that women are more open about their feelings and are more inclined to seek professional help if they have a problem. Another mood disorder is bipolar disorder (formerly called manicdepressive disorder). At first, bipolar disorder often seems to be depression. 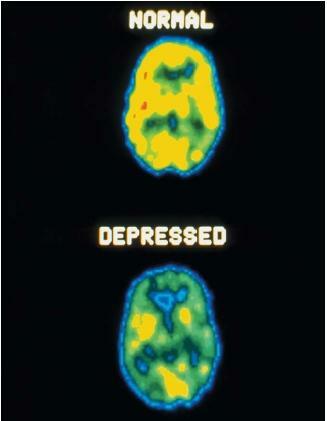 A person suffering from either of these disorders experiences periods of depression. However, in bipolar disorder, a person goes from periods of depression into periods of exaggerated elation (happiness), called mania. Manic people have excessive energy. They may feel exuberant, creative, and ready to take on the world. They often feel that they need little sleep and may even get only three or four hours of sleep during the manic episode. Other symptoms of mania include irritability, rapid and loud speech, and an inflated self-confidence. Medications known as antidepressants are considered standard therapy for depression. These medications raise the level of certain neurotransmitters in the body. Psychotherapy, used either alone or along with medication, is also an effective treatment for depression. Psychotherapy allows the psychiatrist to help a depressed person change his or her distorted views and beliefs about themselves and the world. Both medication and psychotherapy typically take several weeks or months to become fully effective, and neither can help everyone. For those who are not helped, or whose symptoms are very severe, an alternative is electroconvulsive therapy (ECT; sometimes informally called shock therapy). In this therapy, electrodes are applied to the head (or to one side of the head) and the patient receives an electric shock strong enough to cause muscle spasms and convulsions. The main drawback to ECT is temporary memory loss. Patients usually recover most of their missing memories within six to nine months. However, the few days immediately before the therapy are permanently lost. Since ECT can be a life-saving treatment for severely depressed people, it is appropriate when nothing else can provide help fast enough. Bipolar disorder is most often treated with lithium, a natural mineral salt. While there has been a great deal of success in treating bipolar disorder patients with lithium and returning them to a normal life, researchers are not exactly sure how it works. It is a nonaddictive medication, but its dosage must be carefully monitored. Possible side effects of lithium therapy are stomachache, nausea, vomiting, diarrhea, hand tremors, thirst, fatigue, and muscle weakness. Lithium therapy now allows many people with bipolar disorder to participate in ordinary everyday life. Seventy to 80 percent of bipolar patients respond well to lithium treatment without any serious side effects. I recently went through depression and this article really helped me understand what i was going through! This really helped me to understand what I go through and now I can talk to my doctor about it. My boyfriend is depressed, I've noticed he goes through these "periods" of depression but I haven't said anything just unknowingly to him tried to do something to get his spirts up. We had a fight today, because he likes to drink. Not vodka or anything just these things called Four Lokos, he doesn't drink often but when he does it doesn't stop for a few weeks and he talks about this from the moment he wakes up till he goes to bed. He does it jokingly so I can't get mad. Today during our fight we had plans to go to the movies together, we don't get to go out much due to funds and things so its nice when we do. Now regaurdless that it was just a 3 hour movie we were going to go see he made plans to see his friend. Which hurt me because he made plans with me. It shot back at me like I don't let him see his friends and its my fault that hes depressed (he finally told me he had it today). Now, I know its not my fault but it doesn't mean it doesn't hurt anyless. I have no idea how to cope with this, how do I help? I've tried studying on depression and learning as much as I can. But he says if I help it makes it worse. He just wants to sleep and be away from me. I've offered to go to couples and seperate counsling, but he says no it doesn't work. I've talked to him about going to a doctor to get it undercontrol but he says he has before and the pills he had before made him suicidal, so how do help without helping? Things I can do for him? Things I can do for me?